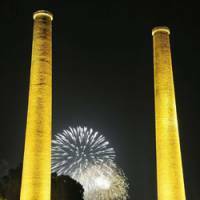 FUKUOKA - A festival commemorating the 100th anniversary of a pair of huge chimneys was held in Tagawa, Fukuoka Prefecture, on Saturday, as 1,000 fireworks were shot into the sky for the smokestacks referred to in the famous “Tanko-bushi” summer festival song. 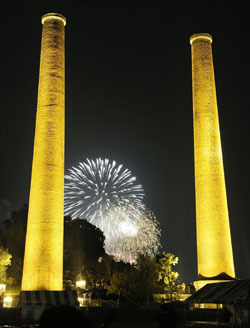 The 45-meter-high brick chimneys were built in 1908 at a coal-mining facility in the town. “Tanko-bushi” (“Coal Mine Song”) was originally sung by mine workers in Tagawa. It has become one of the most popular dance songs across the nation for the Bon summer festival after a record of the song was released in 1932. “The chimneys are so high that the moon should be stifled by smoke,” part of the song goes. “The town once thrived thanks to the coal mine. I hope the chimneys, the symbol of the town, will be preserved for all time,” said 85-year-old Matsue Mitsuji, who attended the anniversary ceremony.